Mavic has seen the success of the cassette hub market. It's benefit, for those who aren't aware, is the reduction in gross weight of the rear hub arrangement (hub and separate freewheel). Using a 130mm long axle, this 8 speed Mavic rear will work with all shifters because it spaced to the industry standard 4.5mm/cog. The Mavic 571/2 has a one piece aluminum hub shell, and uses a mixture of sealed cartridge and needle bearings very effectively to make what is without question one of the smoothest freehub systems we've seen. The shell is turned on a lathe from a single piece of aluminum rod stock with some polishing. The non-drive side bearing is a precision sealed cartridge type. The hollow axle is machined from aluminum rod and has a 10mm outer diameter. The non-drive side end is threaded for a steel positioning nut which holds the axle place. A machined aluminum thread-in nut encloses the non-drive side bearing and the gap around the position nut. For the freehub mechanism, a steel shank extends from the hub. 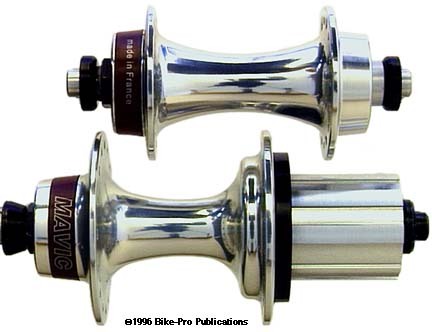 Its machined outer surface serves as the axis for the freehub to very cleverly revolve and ratchet against. The axle has a steel sleeve that surrounds it in the freehub area. The sleeve adds rigidity and makes an inner bearing surface for a set of twelve 2mm by 10.5mm needle bearings held in a small steel retainer. This bearing set revolves within the protruding steel shank. Two pawls are fastened by a Torx head bolt into the hub flange. The pawl pushes against a rotating steel ramp set in line with the cogs on the freehub. This is very clever because the springs are subject to less wear. The machined steel shank itself serves as an inner bearing race for a second set of twenty-two of the same sized needle bearings revolving around the protruding shank. At the drive side axle end there is a last sealed cartridge bearing, this one has its inner seal removed so the bearings can be inspected and re-lubed in necessary. 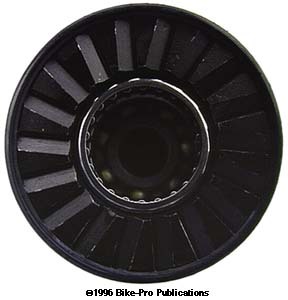 The freehub comes apart for inspection and re-lubrication very easily. Removal of a steel end cap allows the entire freehub body with internal bearings to slide off the hub. The Mavic freehub carrier is notched to fit Shimano's Hyperglide cassette cogsets, so it can be used as a direct replacement in any Shimano application. Though this freehub is just 12 grams lighter than the Shimano 7403 rear it is mechanically far superior. The front hub has a 49.5mm hub flange diameter, with flanges spaced 55mm apart. The front spoke holes have a 40mm center circle diameter. 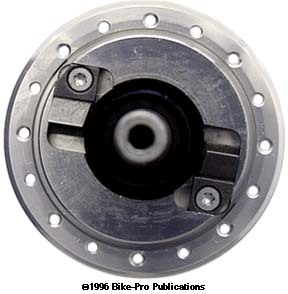 The rear hub has a 62.9mm hub flange diameter, with the flanges spaced 52mm apart. The rear spoke holes have a 53mm center circle diameter. With skewer, the front weighs 244.5 grams, (skewer is 83 grams), the rear with skewer, and without cogs, lockring or spacers, weighs 444 grams, (skewer 88 grams). The hubs are available in either 28, 32 or 36 hole drilling, matched the way you want. Please specify hole pattern.